Nurse Florence Aby Blanchfield was born in Shepherdstown. March 31, 1919: Governor John Jacob Cornwell signed legislation that created the West Virginia State Police. The governor appointed Jackson Arnold, grand-nephew of Gen. Thomas J. ‘‘Stonewall’’ Jackson and former executive officer of the 1st West Virginia Infantry, as first superintendent. April 1, 1884: Nurse Florence Aby Blanchfield was born in Shepherdstown. 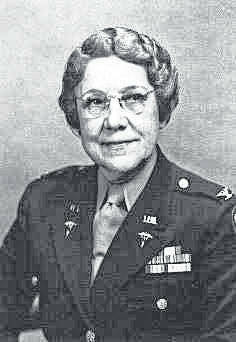 She served in the Army Nurse Corps during World War I, oversaw expansion of the corps from 1,000 to 57,000 during World War II, and became the first woman to hold a permanent commission in the regular army. April 1, 1934: A sales tax went into effect in West Virginia for the first time. The tax of 2 percent helped fill the revenue void caused by the drop in property values during the Great Depression. April 2, 1900: Marlinton was incorporated. The town is generally considered to be the location of the first white settlement in the Greenbrier Valley. April 3, 1755: Frontier scout and ‘‘long hunter’’ Simon Kenton was born in Fauquier County, Virginia. Upon leaving home, Kenton first traveled north through present West Virginia to Pittsburgh and then explored, hunted, and trapped through much of the Ohio Valley. April 3, 1908: Samuel Starks died in Charleston. Starks became the first African-American in the United States to serve as a state librarian when he was appointed to the position in 1901 by Governor Albert Blakeslee White. April 4, 1980: Musician Red Sovine died in Nashville. Sovine, born Woodrow Wilson Sovine in Charleston, gained country music fame for his recitations, especially those incorporating sentimental truck driver themes. April 5, 1856: Booker T. Washington was born a slave in Virginia. In 1865, he moved with his family to Malden to join his stepfather, who had escaped from slavery during the war. April 5, 2010: An explosion at the Upper Big Branch Mine in Raleigh County killed 29 workers. Only two men escaped from the mine alive. It was the country’s worst coal mining disaster since November 20, 1968, when the Consol No. 9 Mine at Farmington, West Virginia, exploded, killing 78 workers. April 6, 1938: The Civilian Conservation Corps established Camp Kanawha in the Kanawha State Forest. The CCC removed all of the abandoned houses, coal tipples, and other structures no longer in use, and constructed roads, the forest superintendent’s residence, office, maintenance building, and picnic shelters.